Today you could easily find a decent quality DVD player for under USD 50; therefore many people just throw it away when it’s broken and just buy a new one instead of repairing it. But as the microcontroller and electronics hobbyist you would be amazed of how these junks could be become your home’s lab valuable asset and these electronics stuff perhaps worth almost USD 50 if you buy it one by one. Recently I’ve got this junk from my relative and luckily the power supply it’s still working, this is your first valuable asset; as you know most of the DVD player has a good quality switching power supply to power both the electronic circuit and the motors (mechanics). 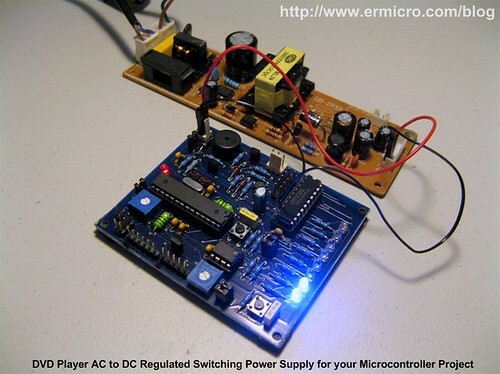 The AC to DC switching regulator is powered by the STMicroelectronics VIPer22A switching chip with its high power MOSFET (Metal Oxide Semiconductor Field Effect Transistor) and the Everlight EL817 photo coupler feedback to completely isolate the DC output from the AC line. 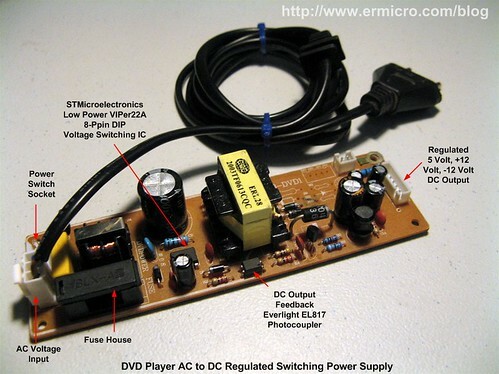 As you’ve seen from the above picture the DVD player power supply module comes with the AC power socket, the power switch socket and has 1 Amp nice fuse house. This power supply module could deliver 5 volt, 12 volts and -12 volts regulated DC output which is suitable for most of your microcontroller based project. By putting this 150 mm x 45 mm PCB module inside the nice box, you could have your own home lab high quality switching power supply. For the safety purpose, you should always take extra precaution when working directly with the AC line; if you are not sure what you are doing just forget this whole DVD player power supply cool stuff idea. Now let’s check out the DVD player front panel electronics stuff. From the above picture we have the common anode special manufactured seven segment LED, the IR remote sensor, the 10K potentiometer (used for karaoke microphone volume control) and three micro switches. The special made seven segments LED have 7 digits display and three seven segment indicator for showing the DVD playing status (the circle shape LED), the CD status (DVD, VCD, MP3, PBC, Play and Pause) and the output status (Repeat, DTS, Dolby and the Time Separate Marks). The display and input switch is controlled by the exotic 28-pin TM1628 chip manufactured by Shenzhen Titan Micro Electronics. From the datasheet, this TM1628 chip used serial interface to communicate with the DVD player processing circuit similar to the standard SPI (Serial Peripheral Interface) slave device which have the strobe pin (chip select), serial clock pin (SCK), data in (SI) and data out (SO). 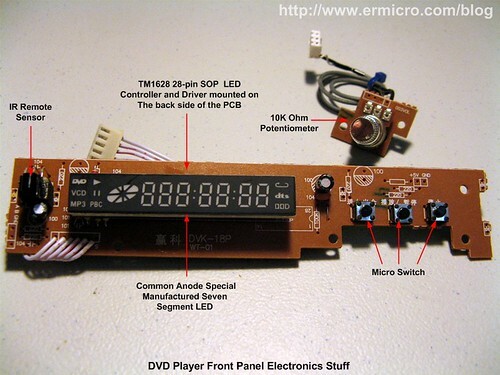 This DVD player I/O module is your second valuable asset which can be turn into your next nice digital clock project or you could disassembly all the electronics parts and use it as you like. Other cool stuff that I’ve not shown here are the DVD player mechanic parts, for the robotics hobbyists this motor and its gear stuff could become their third valuable asset. From now on if you happen to have or to get the discarded DVD player, think of it as your source of valuable electronics parts and at the same time we could help to recycle these electronics junks and make them worth again.